Why blog? Why not blog? While at a party last weekend, a guest asked me, after hearing that I'm writing a blog, "What could you possibly write about before leaving to travel the world?" In the beginning, I was concerned I would run out of ideas, writing every other day. So far, so good. Readership is in the 1000's, growing rapidly, much to my surprise from all over the world. As time marched on, it became therapeutic, as in writing a journal. For the near future it would serve as a means of updating family and friends as we saunter from place to place about the world, living "life" as Tom says, not vacationing. (Vacations are for leaving one's home to enjoy visiting other surroundings, relieve stress, experience new cultures and adventures to ultimately return home to "the real world"). We won't have a "home". That explains the therapeutic element. Having no home is an emotional adjustment, is not for everyone and was inconceivable to us only a few years ago. Of course, in no way do I mean to imply it is comparable to being "homeless," a sorrowful fate for many without the love, support and emotional freedom to escape poverty. In our case, choosing to be without a home defies all traditional convention and social mores. Many are shocked by our willingness to do this, some amused and others annoyed, saying, "They won't last." Maybe we won't. If we don't, we will write about it here, baring our souls for those interested. In the next few months, with the help of a highly professional web/blog designer we will enhance this blog. We'll be creating links for money saving travel information, insurance needs, prescription drug savings tips, travel concerns, travel products we're using, foods we're experiencing around the world that fit into our low carb, wheat, starch, grain and sugar free lifestyle, restaurant observations, vacation homes we love, cruise commentaries, airline experiences and more. Most of all, we will share the photos and stories of the nature we are blessed to behold and the people we are fortunate to meet. Hopefully, we'll both become better photographers. Currently, we are researching lightweight, easy to use, digital Bluetooth enabled cameras with a few new prospects being released soon. (We'll keep you updated). To offset some of the cost of the professional blog designer, we will be incorporating some relevant advertising, as you will currently find on most web sites and blogs. A few days ago, I ordered business cards with our email and blog addresses, after both of us tired of writing on little pieces of paper (especially with my horrific illegible handwriting). When they arrive, I'll take a photo and post it here. More to pack! You may email us at any time, if you prefer not to post online comments. Always feel free to make suggestions to us, as many have thus far in comments and in private email, all of which we appreciate and take to heart. Research is one thing, experience is another. We more than welcome your experience. And please, take advantage of our hundreds of hours of research, if you are looking for a bargain or a shortcut. BTW, if you want to read my story on the blog of Jonathan Bailor,The Smarter Science of Slim, please click here. My story is the second story down, moving from the first spot over the past week. Thanks to all of our readers and, to Jonathan's readers who have come over here to read our blog. Off to the health club now for my 10 minute killer cardio workout, after an hour long walk with my neighbor earlier this morning. Then off to the grocery store to stock up for the long weekend. Friends are coming for Eggs Benedict brunch on Sunday when I'll be using that cute little 1950's double boiler as seen in the photo in the last post, maybe for the last time. (The recipe is also posted there ). Bye, double boiler. Hello, world. Estate sale, pantyhose and Eggs Benedict...What??? Ha, ha! 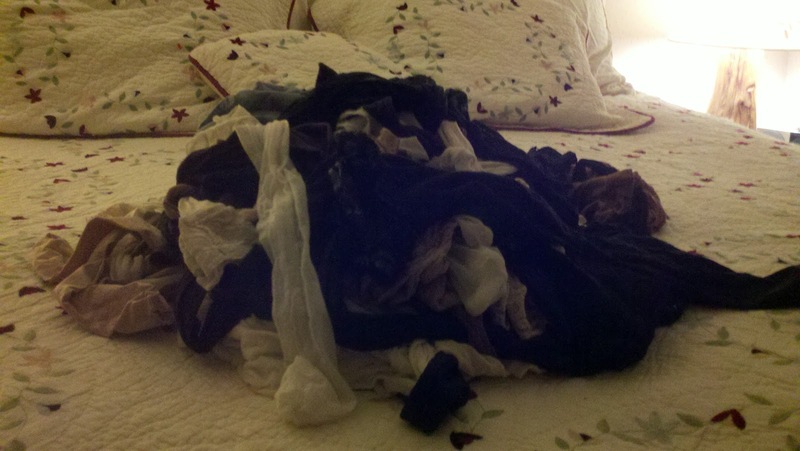 A lifetime of pantyhose that I pulled out of a dresser drawer! I can't imagine these would sell at the estate sale! Over the past many months in preparation for unloading all of a lifetime possessions, I've emptied drawers, closets, and a few cupboards. After all, we are living here, continuing to prepare meals, do mountains of laundry, endlessly entertain and amuse ourselves utilizing copious technological devices. As time marches near, two months and four days from today, I peruse the items left on the shelves, in the closets, packed into kitchen cabinets and overstuffed drawers and of course, the intimating array of tools and miscellany in our old basement, Tom's domain. What'll we do with all of this "stuff?" We've packed no less than 15 totes of items (the tip of the iceberg) to sell at our upcoming estate sale beginning on Thursday, October 25th, jammed into one of our three guest rooms. Good grief! No overnight guests, please! There's no room to walk around the bed, let alone lay in it! Another guest room is jammed with banker's boxes of six years' of tax returns, plastic totes filled to the brim with "can't part with" Christmas decorations, photo albums and memorabilia, to be stored by our adult kids (thanks kids!). Other than the storage of these six totes, we will have no storage, no "stuff", nada, nothing when we own other than the luggage in our possession. Months ago, we arranged with Jim Anderson, owner of Caring Estate Sales to conduct our sale. We've met with him twice, spoken to him on the phone a few times, feeling confident about having chosen him. When we met with him, he specifically stated, "Take everything you want to keep out of the house before October 25th; luggage, totes for the kids to store, food in cupboards, leaving behind everything to be sold, including the clothes in the closets. Leave everything in its place! Don't pack." I packed the 15 totes. Why? I don't know why. I just did it. It made sense months ago to start going through everything, tossing unwanted unusable items, taking usable items to Goodwill (which I did) while sifting for morsels of memorabilia. Now I must stop. Speaking to Jim again yesterday, apologizing for asking the same question over and over, acknowledging this would be the last time I'd ask, "Do I really leave "stuff" in the cupboards, closets, drawers? Does Tom need to go through everything in the basement, sorting and tossing?" His answer, "Yes, leave the stuff in its place and...no, Tom doesn't have to go through anything in the basement. We prefer to do everything ourselves, pricing as we go. You will inspect and approve the items and the pricing before the sale begins." I'm flabbergasted! It finally sinks in: leave everything in its place. Stop packing except our luggage and the totes for kids. What does this leave me to do in regard to "stuff" only, that I haven't done thus far? (Bear with me, it helps to make a partial list to which I continually add as I really dig in after Labor Day. I'll copy and paste the list to my "to do" tab in Excel). Empty and clean the two refrigerators and huge freezer in the basement, the Subzero in the kitchen, distributing all usable food to our kids and neighbors. Clean out all the food in the storage room in the basement and all food in kitchen cabinets. Remove all wine from the Subzero wine cooler in the kitchen, beer in the basement and distribute them to family and friends. Empty and clean cabinets in bathrooms of all toiletries. Clean Tom's walk-in closet. He has the equivalent of three large totes of relatively useless papers to go through. Of course, this list does not include trip related tasks: second passports, visas, banking, doctor appointments, final immunizations, prescriptions, insurance, selling our cars, setting up our mailing service in Nevada, changing addresses for all of our insurance, credit cards, banking, etc., on and on. I've had way too much time to think about all this. Realistically, if we waited until the last month, we'd somehow get all of this done. 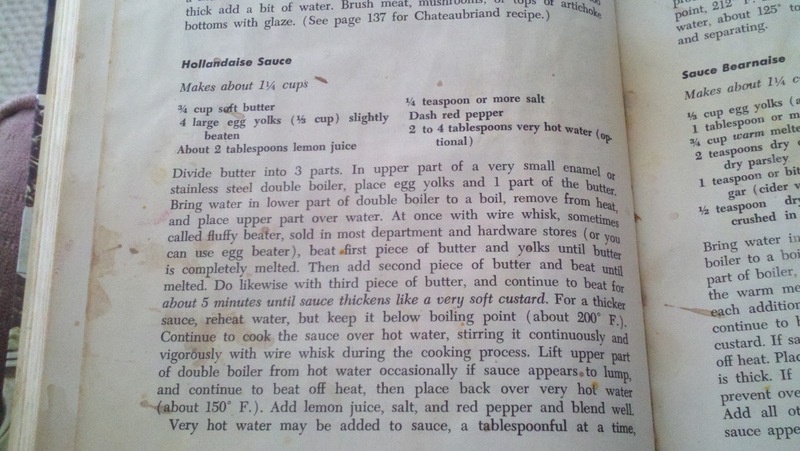 Now, I have to go dig out my favorite recipe for Hollandaise Sauce from The New Antionette Pope School Cook Book, published in 1973. 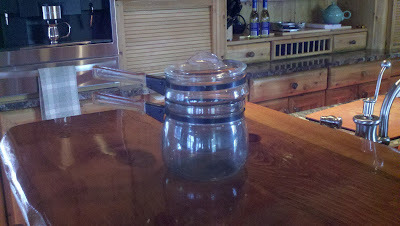 This is my double boiler which purchased years ago at an estate sale for $2. I gave it to my friend Karen who kindly offered her home when we'll need a place to stay before the sale begins at our house. 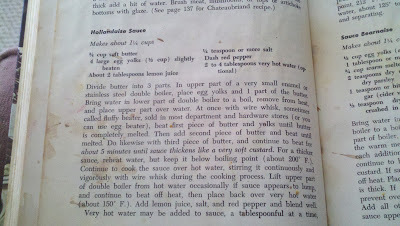 It is this very recipe that assisted me in winning First Place in an Eggs Benedict Contest entitled, 'The 1986 Eggs Benedict-Off". 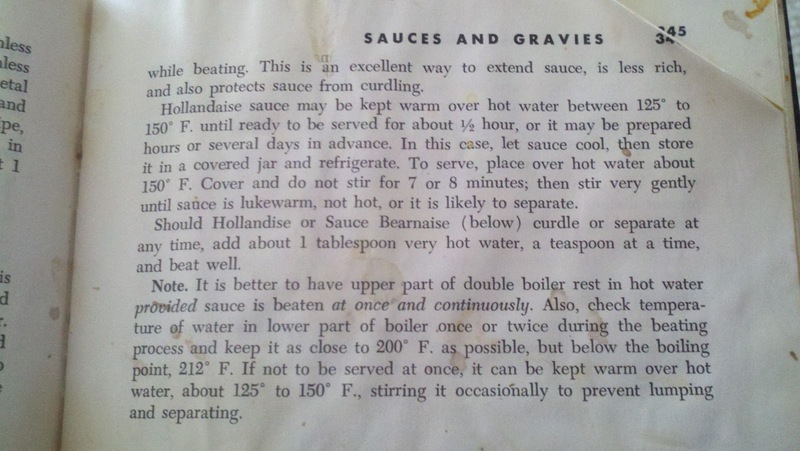 Here's the recipe for the sauce. Its much easier than it looks. 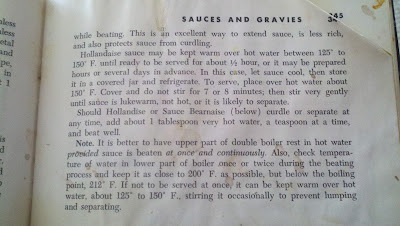 I must make this recipe one more time before the sale using my absolutely perfect 1950's glass double boiler that I bought 30 years ago at a garage sale for $2. OK, I will go get the double boiler from the storage room in the basement and take a photo which is below. Bye, double boiler. Hello, world. At times we find ourselves listening attentively to an animated senior citizen, hanging onto their every word, of a bygone era filled with breathtaking stories far removed from our own reality. Many of us envision a blissful time when we will be that senior, finally at peace with our own mortality, sharing such stories with a younger generation, hoping that they will glean a delectable morsel of the wisdom that ultimately will carry them through life. Often, we hear the same stories over and over, to the point that we remember them better than they, finding ourselves filling in the blanks to kindly and lovingly help them along. Many of the stories go back 50, perhaps 60 or 70 years ago. Somewhere along the way, time seemingly stood still while no new stories were gathered, to be embellished or to be shared with the wide-eyed young recipients. In time, to the older crowd, the retold stories are gently perceived as snooze-worthy, tolerated and bemused. With love, we smile, we laugh, we ask questions we've asked many times before and... we act surprised. Its charming. Its precious. But deep inside that angelic soul, a story is told of a life that was once lived a long time ago. Is that our fate? As we enter the last third of our lives, can we choose to begin again, a new phase, a new chapter, filled with awe and wonder while living in the moment building stories we can share tomorrow, in a week, a month or a year? Can we overlap our stories as we live them to the fullest, events big or small, trivial or profound? Yes, we can. Today, we can see a white squirrel run through the trees in our yard, snap a photo to share it tomorrow with an inattentive five year old, and suddenly their eyes look upward in hopes of seeing the flash of white leaping from tree to tree. This becomes a story, relevant, today. A few days later, we're playing cards with the neighbors laughing so hard we throw back our head and our glasses fly into the air, landing in the fruit bowl on the table and then, we laugh some more. This is a story. We laugh again when telling it, hoping they will laugh along with us. And they do. Life is big and small, adventurous and dull, quiet and lively. Stories of today and tomorrow, interspersed with those of long along, may help us find our way to a fuller life that only ends, when it ends. If we hadn't had over six months to plan our travels for the next five to ten years, it would have seemed impossible, bogged down in the details. So far, I keep taking deep breaths moving closer each day, some days at a crawl, others days a marathon. Unloading our home and everything we have accumulated in a lifetime, except for a few totes our kids will store, the six suitcases, two carry on bags, computer bags and handbags (Tom's murse), could be overwhelming in a shorter time frame. Not only must we continually address the travel planning, the shots, the doctor appointments, the insurance policies, the retirement board, but also the mounting piles of paperwork to prepare, scan or shred. In the interim, we have "life" to live, dinners to cook, clothes to wash, flowers to water, everyday errands to run and most importantly, family to see as often as possible. Fit in time with friends, daily walks, answering email, Facebook lurking and time rapidly flies by...two months and eight days until we walk out the door, leaving Minnesota and everyone we love behind. Oh, I'm not complaining. Actually, I love every moment. This in itself, is a joy filled time, complex with never ending challenges, hopeful solutions and tons of new information flooding my brain. I didn't know "it" had room after the "information load" environment in which we live. But, it does, grabbing every tidbit of new data flooding into it's mushy cells. Yesterday, we took most of our grandchildren to Train Day, a family picnic provided by Tom's employer. The little ones had a blast exploring the gigantic train engine, a bright red fire truck; bouncing in the huge blown up contraptions, eating overcooked hot dogs while hanging out with us, PapaChooChoo and GrandmaChooChoo, We had a memorable day. Several months ago, I posted a note on my calendar (one of many) to apply for new debit cards. They'll expire at the end of January after we've already left the country. Since debit cards cannot be forwarded, this would have caused undue stress. Our goal, as always, is to prepare so much in advance that we don't often have to "kick ourselves" for forgetting to do a task such as this. On our way to Train Day, we stopped at the bank to order the new debit cards. While the banker ordered the cards, a thought popped into my head: we must set up a wire-transfer account in both of our names, providing us with easy access to our accounts (via a phone call as opposed to email for security purposes). This was on my list for this upcoming October but why not get it done now? Two more of the minutiae out of the way! Returning home, I immediately ran around the kitchen making the crusts for our low carb, gluten, grain and starch free pizza for Friday Night Pizza, our favorite dinner. Later today, I will make homemade salsa and cornbread to bring to one of the last of a few parties we'll attend tomorrow. (Recipes for all of these items are on my earlier posts. Simply hit the search filter). This weekend, we're planning to put all of our empty suitcases in the back of Tom's SUV to ensure they'll fit, along with the two totes we're bringing for my son Richard Lasica, a successful real estate agent in Henderson, to store for us in Henderson, Nevada. If they don't fit, which I suspect they will, we will price rent a small trailer to haul behind us or...bear the cost of shipping the totes. More minutiae. It seems to grow rather than diminish! We can't wait to be sitting in a lawn chair overlooking the ocean in our little beach house in Placencia, Belize, starting on January 28, 2013 which is five months and seven days from today. Oh oh, while in Belize we'll have to prepare our 2012 tax stuff for our accountant as soon as we receive (online, of course) the W2's. Yuck! Minutiae! You can run but you can't hide! Oh, the Clark's boots! I wanted to keep them so badly that I took them to a long established boot and shoe repair company in Wayzata, Minnesota, Bob's Shoe Repair. Brian, a young although highly skilled leather craftsmen at Bob's was confident he could cut out three inches out of the calf of the boot, put them back together leaving me satisfied with the comfort, look and fit. He succeeded. Thanks Brian! I picked them up yesterday and couldn't be happier. The cost for the repairs: $100. Total investment in the boots including repairs: $249. With the promise of a great rating online, I offered the seller of the boots a five star rating, if he'd credit me the $14.95 I paid for shipping. He immediately posted the credit to my PayPal account. boots indicated a 14" calf circumference when in fact, it was 16" resulting in the necessity of the repair. I would have been satisfied with 14" circumference. (My outrageously skinny calves measures 12.5"). Now, I'm beautifully repaired, I'm content. The sinus infection I reported on two days ago is improving without seeing the doctor or taking antibiotics. The pulsating headache would have driven me to seek help had it not begun to dissipate late in the day yesterday. Today, I awakened with only a slight headache for the first time in eight days. Its on its way out. Thanks, Neti Pot, Aleve, Tylenol PM at night (with acetaminophen and Benedryl), lots of water, less dairy and light activity, coupled with periods of rest, good food and the loving support and comfort from my hubby. Now, I know I will most likely survive a sinus infection without antibiotics. In the beginning stages of figuring out our insurance needs, I spent a few hours yesterday with our long time highly competent broker/owner of our local State Farm Insurance office, Chad Babcock. Having worked with State Farm for the past 40 years, we have never had a problem. 1. How will we insure our luggage, computers and equipment without the security of homeowners insurance or a permanent home? 2. Will we be able to buy a policy to avoid the high cost of insurance when renting a car abroad, which may be as high as $30 a day in certain locations? 3. Medicare doesn't cover seniors traveling out of the US and its territories. What type of policy will cover me, turning 65 in six months, while out of the country? 1. Baggage Insurance: Once we acquire our Nevada residency and address, we will be able to purchase "renter's insurance" covering the value of our belongings traveling with us, attaching a "rider" for our computers and digital equipment. 2. Car Rental Insurance: Many have the perception that one's own auto insurance will cover a vehicle and liability while traveling in a foreign country. Not the case! Plus...we won't be owning a car here in the US, if it did. We'll bite the bullet on this one We'll pay the insurance at the time of renting the vehicles throughout the world. 3. Health Insurance: Without Medicare, a senior cannot purchase a supplemental policy which usually covers most of the costs Medicare doesn't pay. Thus, I will be required to apply for Medicare (Tom will have five years until he is 65), pay the monthly fees out of my monthly Social Security in order to receive the supplement. Plan A: The cost of the supplement is $185 a month at this time along with the required Medicare payment for a monthly total of approximately $285. The hitch: traveling out of the country allows a total lifetime benefit of $50,000, rather skimpy. Our insurance guy gave us a quote for me for $432 a month for full coverage, with no limits but add the approximate $99 a month for Medicare, we'd be paying $531 a month, a huge chunk. Tom, obviously younger than me by five years, will be covered up to 94% with the policy offered to him by his employer plus the necessary supplement until he turns 65. His total cost (for the next five years), $207 a month. GRAND TOTAL FOR BOTH: $738 (Yikes! I hadn't budgeted for this amount)! As of this writing, I had a light bulb moment! Duh??? This is not rocket science! Let's look at the realities. Tom with better health than I (as hard as I have fought to win over my genes), rarely visits the doctor. Would the 80/20 (OK out of the country) company provided policy be sufficient for him, saving us $207 a month on the supplement? Plan B: The only difference is 14% (based on the 80/20 coverage without the supplement, as opposed to 94% coverage with the supplement). Then, we purchase the "big guns" policy for me with a $1000 max-a-year out-of-pocket policy with no limits? GRAND TOTAL FOR BOTH: $531 a month!! The financial risk for me?? None! The financial risk for Tom? We'd have to pay a maximum of 20%. Sure, I did the math, the savings of $207 a month over let's imagine five years, is $12,420. If he had a $60,000 medical bill, we'd be even. For now, until we get our feet wet on this adventure, its worth the risk. In the meantime, this pays for the insurance on the rental cars. (If a traveler has an accident in certain foreign countries and doesn't have insurance, they can be detained until the bill is paid in full. Tom just returned home. We discussed the above options A and B and we choose B, freeing up the $207 a month to cover the insurance on the rental vehicles. (We don't plan to have a rental car more than half of each month to keep costs down, vital all month in some locations and seldom needed at all in others). Of course, all of this could be a moot point when Obamacare kicks in. Not intending to get into politics on this site, this uncertainty faces all of us income earning citizens. Where will Medicare be in the next few years? None of us know at this time and, probably won't be able to figure it out in the future. Sick abroad...What wll we do? Last Tuesday during the night, I wandered in and out of fitful sleep with my head pounding. I never get a headache! Dragging myself out of bed, choosing to ignore the heavy feeling in my head, I went about my day knowing something just wasn't right. This feeling continued all week long alleviated to a degree with various attempts: Tylenol, Motrin, and Aleve. Saturday morning, awakening with the worse headache yet, now with a stuffy sensation in my nose and head, I realized I had a sinus infection. In the past, a sinus infection resulted in an immediate visit to the doctor or urgent care for an antibiotic prescription. Every few years in the fall, I've develop a sinus infection. Whether it was due to an allergy from ragweed, prevalent at this time of year, precipitating an infection or merely a coincidence, this is a familiar plight. Antibiotics always work within 24-48 hours resulting in an enormous sense of relief. Everything is different now. After the past two years of retirement and obsessively learning more about health online, we now both feel adamant that antibiotics should only be taken in a life threatening scenario. Why not give in and take antibiotics, I thought several times while bent over the kitchen sink, Neti Pot in hand, pouring warm salted water into one nostril and then the other? Yuck! This is not fun! For us, its more than the desire to avoid antibiotics at all costs. We must learn to cope with the inconvenience of minor ailments that we can easily attend to ourselves. Many times over the years, I wearily visited the doctor, five days into the achy flu, the dry cough, the flaming sore throat, the sore elbow or the swollen knee, convinced that the ailment was only getting worse. Leaving his office, prescriptions in hand, I already felt better and wondered why I hadn't just "waited it out." Placebo effect, perhaps? Yes, it could be. If so, why can't "waiting it out" while taking advantage of home remedies, proven holistic and alternative remedies, plenty of rest, lots of fluids and a light diet provide the same end result? In some cases it may. So, here is my first illness since last fall, and I am trying it out. Motivation? To prove to myself, that while along the way in our travels when we are living on the island of Madeira, (for example) for three months, 1200 miles from the coast of Lisbon, Portugal that we can be proactive as opposed to reactive when it comes to our health. Its about tolerance, creativity, patience and good sense. Of course, we will seek medical care wherever we may be, if a situation is serious or life threatening. I will post here with the results of this "experiment." 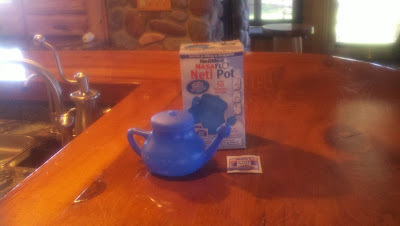 The Neti Pot is calling me. I put it off this morning when I stumbled out of bed, head spinning, promising myself I'd do it at noon. Well, noon has passed. Here goes! Saying goodbye to family will be tearful. We will hug. We will kiss. Sobs will catch in our throats. No doubt. We will see one another each week on Skype, communicate through email and see their faces in photos on Facebook. They will be "with us" in our hearts and minds each day, counting down the days until they come to visit us from afar. This we know for sure. Saying goodbye to friends will be different. We all dream that once a friend, a friend forever. Not the case. Its no one's fault. It's nature which intended us to gather around our core family for love, support and companionship. in the wild, animals form a family group welcoming "outsiders" of their species. In humans, we welcome "outsiders" on our own terms: knock before you enter, respect their family times, don't call during dinner, don't expect to be together on holidays. In essence, make an appointment to see one another. That's a learned behavior in our human society, not a part of our nature. Thus, as we prepare to go away, we do so with this certainty: we will see our family again, we may not see our friends. Its a reality. It still hurts. Yesterday, in one single day, a dear friend Chere, an amazing friend, came for a low carb, gluten free breakfast. With many common interests and years as friends, we simply couldn't get enough of one another; sharing, smiling and laughing. When she was leaving, I hesitated, "Will I see you before we go," I asked. She squeezed my hand while we hugged, "Of course. I'll be back several times before you go." I wanted to believe this. I wasn't sure. Second friend of the day, our delightful next door neighbor Nelleke, from whom we'll be renting her home in Majorca, Spain next May. Most days, she and I walk the neighborhood with her little white Westie, Max, chatting on endlessly about our dreams, our hopes and our disappointments. She's a strong and sturdy senior, a fitness aficionado, like me and young for her age. She's leaving today for a week to visit family. I will now know what it is like without her. Later in the day, the third friend of the day, our precious neighbor Sue, showed up at our door for happy hour, staying until 9:00 pm, when we walked her home, bellies full, still giggling over our enjoyable evening together, the three of us. She lost her beloved husband and our friend Chip, whom I wrote about here on June 1, 2012. I was given the honor of speaking about him at his memorial service only a month ago. We miss him. We will miss her. As we walked Sue home at a little after 9:00 pm, reveling in the starry night sky, so bright away from the city lights, we ran into our friend Jamie, another amazing neighbor and friend, stopping to chat. Only days ago, she discovered that her little dog Bella, has cancer. I was reminded of losing our Willie such a short time ago and can only hope that little Bella experiences a better outcome. I will miss Jamie and her family. More friends will come to visit, to say goodbye before we go. Each time I will wonder, will we see them again, before we go, 74 days from today? Will they email? Will they stay in touch? 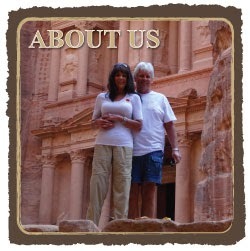 Will they read this blog from time to time for an update on where we are, perhaps considering a visit? Friends have moved away and we have stayed in touch. My friend Carol, a friend for 27 years, an airline pilot, moved away over 25 years ago. We text, we email, we visit one another, we talk on the phone never losing touch. There are more all over the country that don't let it slip away, that are still "part of the pack" kind of friends. Then there are the friends with whom we talked with almost everyday, that left, never to return, never to talk, never to write. Suddenly, they appear on Facebook. We smile. We are happy to "see" them again, not angry we lost touch. In most cases, we both failed to stay in touch. Its all a part of this life we live. We love, we lose. We lose, we rediscover. Whichever way it goes, we accept it, still loving them, still holding on to the memories. This, dear friends, we know for sure. "Time is of the essence" is a term in contract law which indicates that the parties to the agreement must perform by the time to which the parties have agreed if a delay will cause material harm." After spending 25 years as an broker/owner of a real estate company, I came to appreciate the significance of being on time, not only to ensure my buyers or sellers complied as stipulated within the term of their contracts, but also my being sensitive about the time of others by always being on time. Now as Tom and I near the time to leave our home for good, in the hands of others, on October 31, 2012, a mere 2 months and 16 days away, time seems to be moving so quickly. Tom leaves at 5:30 am each day, often not returning until 7:00 pm or later. Exhausted, he showers, eats a down-sized gluten free, low carb dinner with me and falls into his comfy chair with only a few hours before bedtime. He can't help me during the week. Understandably so. On the weekends, he tends to the yard, works on his Ancestry.com file which he is preparing as a legacy for his family before we leave. He does any needed household maintenance with aplomb and a smile and then...spends valuable time chatting with me about our endless planning. Time is flying by. A friend recently asked me to spend a day visiting at her home. With only 76 days left, I had to apologetically say "no." Maybe an hour for tea, not a day. Another friend asked me to help with the planning of a new business, something I would usually have loved doing. Again, I had to say "no". In the past, I always said "yes." Always. Nothing is more important than spending valuable time with our family and friends. But, as time nears and more tasks are facing us and...with every one's busy lives, there never seems to be enough time. How does one spend more time together now to "make up" in advance for the time we won't spend together in the future? You can't. Much to our surprise, we're not overwhelmed. Maybe we've had too much time to prepare, to think, to accept, and to discuss. Sure, I could share the seemingly endless list of "to do's" many of which may only be done during the last month. But, I won't bore you with the details on a list. I will share them as they transpire along the way, as I have done thus far. People often ask if we are excited yet. No, not yet. We are saving that for the day we leave. I am trying to enjoy the process, the challenge, the management of the mixed emotions that flutter through my head each day, occasionally questioning the sensibility of this mammoth decision, to moments later, smiling at our adventuresome nature. Every minute that passes brings us one more minute closer to the end of our lives. Perhaps, for some, this is a morbid thought. For us, this is an opportunity to embrace every moment, living in it fully as it transpires and joyfully planning for that which is yet to come, should we be so fortunate that more time is on our hands. My neighbor took this photo of me this morning in our yard. From a family with endless variations of heart disease, raging diabetes, rampant obesity, stroke-inducing hypertension, crippling spine and bone disorders and myriad autoimmune disorders, its been a lifelong battle for me to be healthy, slim and fit. My genes are against me. It hasn't been easy. I started dieting at eleven, exercising at fifteen, feeling as if I were a hamster on a wheel, peddling faster and faster, never getting ahead of the curse I had inherited. For many, this is not an uncommon plight. Add raging hormones into the mix, and for many years, a long and healthy life seemed hopeless. My wardrobe consisted of clothing in sizes 2-14, my refrigerator stocked with foods for the latest fad diet promising a solution that would make this preoccupation with food and exercise gone for once and for all. I have tried them all. Somehow, I managed to stay relatively slim and moderately fit, but not necessarily healthy. In all these years, I consumed no fast food, no fries, no burgers, no fried foods, and very few sugary snacks or desserts. Constantly hungry, always craving sweets and struggling with portion control, I blamed it on a my own lack of willpower. Over the past 40 years, I blindly followed the "government's" recommendation to eat a low fat diet with "healthy" whole grains, fruits, vegetables and lean meats in small portions. Nothing improved. I didn't use butter, mayonnaise or salad dressing fearing too much fat. I ate six or more servings of vegetables per day and consumed plenty of fiber. Nothing improved. My cholesterol and triglycerides were high, my HDL too low, my weight teetered back and forth, I experienced constant pain often feeling weak and unfit. Yet I continued to "work out," never less than five days a week, often for an hour and a half at a time. I changed up the workout every month as "they" recommended. I walked, I lifted weights with a torn shoulder and arthritic knee, I stretched and I tried yoga. A few years ago I invested in a BodyMedia device that I wore on a stretchy band on my bicep for two years, measuring all of my activities, aiming at a minimum of 10,000 steps per day. Most days it registered 12,000 steps. But, nothing improved. NOTHING!! So what? I was active but, my appetite increased the more I moved. Should I be eating even less and exercising more to get to a level of fitness that would bring me some relief? I was frustrated and stymied. When I retired two years ago, I began spending most of my days when I wasn't struggling at the health club, researching for a solution to the pain, the incessant hunger, the high blood sugar, and a failing exercise routine. My legs felt like lead and walking in itself, became almost unbearable. How would I continue working out? Doing so gave me a few hours of pain relief when I was able to muster up a small surge of endorphins. A year ago, I began to accept the reality that traditional medicine failed me and that I was doomed to a life in a wheelchair In desperation, I sought the help of renowned local chiropractor, Dr. Jamey Antione at the Minnesota Disc Institute, whom I had heard was a miracle worker. After reviewing my three MRI's, indicating advanced joint disease, he suggested a treatment modality which included an inflammation free diet. He was adamant that I quit consuming grains, all grains, handing me printed literature about the diet. I was eating healthfully, so I thought: lots of whole grains, no white flour, no sugar, organic vegetables, fruits and smoothies made with protein powder, bananas and frozen strawberries. I purchased most of our produce directly from an organic farm during the summers. It all seemed so right. Eager to do anything to feel better, I began researching again, hundreds of studies, books, websites regarding anti-inflammation diets all of which led me to two life changing books: Wheat Belly by Dr. William Davis and, months later to The Smarter Science of Slim by Jonathan Bailor. Had I not meticulously followed the scientific research and resulting lifestyle changes presented so clearly in these two books, Tom and I would not be able to explore the world for the next many years. Already slim, I discovered I was "skinny fat". Tom, sweetheart that he is, feeling burdened by some extra weight around the belly, followed along with me, subsequently saying goodbye to the debilitating symptoms of Celiac Disease and acid reflux. ﻿﻿﻿﻿﻿﻿﻿﻿Now, a year later, Tom has lost 30 pounds, I am no longer "skinny fat," instead feeling lean and fit for the first time. The pain is reduced dramatically, the cholesterol, triglycerides, are way down, the HDL way up (Tom has genetically great numbers. Lucky guy! ), my muscles are more defined, my strength has increased 100%, I sleep better, I am never foraging for food an hour after I have eaten and no longer battling high blood sugar and hypertension. Yes, it has been a huge commitment! Yes... saving one's life is a huge commitment! While going low carb, we chose to go wheat free, gluten free, grain free, sugar free and starch free. We don't eat any processed foods or corn, rice, potatoes, pasta, cakes, pies, chips or any fruit but berries. We enjoy nuts, meats, healthy fats, organic non refined coconut oil, non-starchy vegetables, coconut and almond flour treats. We've learned "why not" of the foods we chose to eliminate by reading Wheat Belly by Dr. William Davis. I could spend hours here explaining why not. I won't get on the soapbox. I do that enough around my tolerant friends and family. If you're interested, read the blog, then the book. Then, the next miracle occurred in the search for great health. Months later, still frustrated with my seemingly useless exercise routine, I stumbled across The Smarter Science of Slim by Jonathan Bailor. Everything changed. This book is not a book of an author's opinion (nor is Wheat Belly). It is backed by 1100 research studies conducted by scientists at Harvard and other universities as to why our diet and exercise routine is not working and...the world is getting fatter and sicker than ever. The Smarter Science of Slim by Jonathan Bailor provides the otherwise complicated studies (70 pages of references in the back of the book) to prove that "eating less and exercising more" is not working. In bite sized manageable pieces Jonathan gives us an exciting and easy read, driving the reader to immediately jump up and start the amazing workout routine that truly requires only 10 minutes, two times a week. Hard to believe! Backed by science! Endorsed by scientists at Harvard! In the exercise world, it is referred to as HIIT, high intensity interval training. It's a killer 10 minutes, I assure you, pumping your own natural under-used life enhancing hormones to run through your body producing a powerful euphoric and energizing sensation, lasting for days, working to grow and strengthen cells and muscles. After only three short months of one 10 minute workout, twice a week, I am more fit, more muscular, in better overall condition than I have ever been in my entire life. My pants fit better, I breathe deeper, I sleep more soundly and I'm able to prepare for our upcoming adventure, able to haul my share of the heavy bags, an impossible feat only months ago. The food portion of The Smarter Science of Slim by Jonathan Bailor has been easy for me. I had already cut out, what Jonathan refers to as "insane" foods. And, most importantly, I discovered that a vital element was missing from our diet...enough lean protein sources and non-starchy vegetables. By adding a healthy portion of cottage cheese and green veggies to my protein rich breakfast, protein and veggies snacks and meals and enjoying a giant bowl of plain Fage Greek Yogurt with nuts and berries for dessert at night, I have increased my protein intake from a meager 50 grams a day to 160 grams a day. I am a new person at 64 years old. If I wasn't already slim, I would definitely be losing weight. Instead I eat nuts by the handful to maintain my current weight. For the first time, my metabolism is increasing. I am now able to consume at least 25% more food, finally feeling full! Jonathan explains how we've been slaves to calories and how "a calorie is not a calorie." There is no carb, no calorie and no point counting. This is not a quick fix diet. This is not a faddish tricky program that requires strict adherence to peculiar combinations or types of food. It is a simple concept, backed by science, to "eat more and exercise less" while enjoying short but intense workouts and healthy portions of nutrient rich foods as often as you are hungry. Many who read this will say they can't give up sweets, bread, corn and potatoes. My life depended on it. It is not a struggle. I am no longer hungry. Nutrient rich food is satisfying the hunger I could never seem to fill. When man roamed the earth foraging for food, he hunted meat, dug up roots, picked berries and nuts while exploring vegetation fit for consumption. Our bodies are destined for this way of eating. For example, it is no different for our dogs who, by nature are designed to eat meat. Give them cereals, grains and corn in their food and they too become sick, sluggish and overweight. The topic of this blog will not change to the topic of fitness. It will continue to be abundant in the realities of mine and Tom's everyday life as we leave behind everything and everyone we have known and loved for all of our lives, as we travel the world for years to come. It will include how we find foods we choose to enjoy to continue to maintain our health. Of course, wherever we may be, I will continue my two weekly workouts, 10 minutes each! It was important to share this piece of our lives with our readers to illustrate how more meaningful this adventure has become for us, having overcome enormous health obstacles, only possible with the years-long diligent research of a few highly knowledgeable and professional individuals dedicated to science. We are wiser. We are healthier. We are grateful. We are now able to travel the world hauling way too many bags! You can tell by the little bulging muscle on the right side of my calf that I have tried to no avail, exercising my calves to build them up. If a scorpion or other such creature sees this gap in the boots, they may find it an appealing hiding place.This may warrant a visit to the shoe repair store. Orange luggage, yes! Fabulous! Top quality! Lightweight! The four giant boxes and two smaller boxes arrived on Friday afternoon. How easily I lifted them into the house! The Fed Ex guy even commented on the lightweight big boxes, curious as to the contents, amazed when I told him it was luggage. Carefully, a little knife in hand, I slit the tape off the over sized boxes to easily pull out the orange bags. Squealing like a kid, I couldn't open them quickly enough, tossing one on the bed to unzip and inspect further. The bags are deep, well constructed, easy to zip. Within minutes I loaded up one of the luggage carts with three of the 30" Antler Bags, topped off with one of the new orange carry on bags. Yes, I knew they were empty. I wanted to see how well the four items would fit on the luggage cart. Perfect! Of course, when they are loaded to the brim with our "stuff" it will be different but...it will be manageable. I was thrilled. Last night, I ordered two more of the 30" orange bags after I sheepishly told Tom we'd each need three, not two of the bags. I'd expected him to flinch when he heard we'd need three 30" bags. He didn't. He smiled at me, reminded of our somewhat preposterous situation, leaving everything behind, taking everything we need with us for the next three years, five years, ten years. Who knows? We'll manage. We'll manage with a grin on our faces. And when the bags feel really heavy, toppling off the cart, landing on a well-booted foot, we will smile, stop, help each other and keep moving on. This we know for sure. And, my Clark lace up boots arrived on Thursday during the jewelry sale. I didn't open the box right away. I had spent so much time looking online, that I wanted to prolong the anticipation a little longer, preferring to stay preoccupied with the sale. Returning home from taking down the hot pink "for sale" signs, I opened the box, feeling giddy over the great find, only to be sorely disappointed when I tried them on. The foot, a perfect fit, the calf, a fiasco! I had measured my skinny calves before buying the boots, checking the detailed description of each possibility to ensure a good fit. They called it "shaft circumference." The description stated a 14" shaft circumference. My calves measured 12.5" leaving adequate room to tuck in pants to keep out 6" scorpions. They lied. The shaft circumference measured 16.5", leaving room for both of my hands to reach inside. 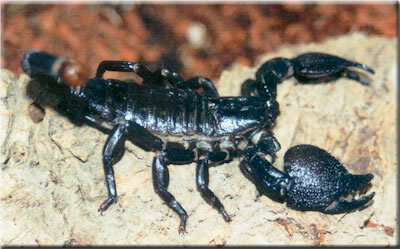 An entire scorpion family could reside in there. No thank you. Now what? 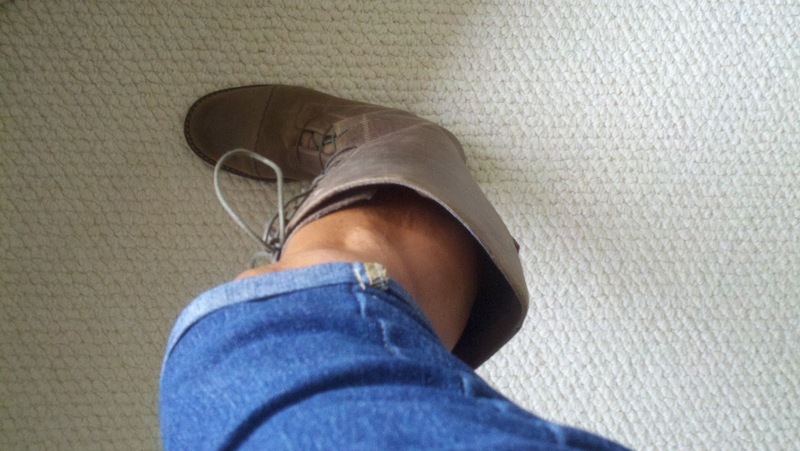 Back to the computer, searching "skinny calf boots, thin calf boots, narrow calf boots, skinny leg boots? No!!! Friday morning, before friends were arriving for breakfast I started calling local shoe repair store. Yes, most likely, it can be done...the shaft can be made smaller, for a price, of course. "Bring them in for an estimate. It could be $70 or more," says Bob of Bob's Shoe Repair in Wayzata, Minnesota, where 30 years ago, maybe 40, I'd go to get shoes repaired. Who repairs shoes these days? Gosh, I sound old. Monday morning, off to Wayzata I'll go with the Clark boots. Thus far, I've invested $149.98 plus shipping for a total of $161.98. This could translate into a total investment of $250. But, the end result may be a perfectly fitted, well constructed, long lasting, timelessly stylish, safe from scorpions, sure footed pair of comfortable boots, lasting for years, that I will be wearing as we dash down the concourse to our gate. Next to my sweetie, I'll be wheeling one of our 250 pound capacity two wheeled carts, loaded up with three 30" orange Antler bags, an orange Antler carry on bag, a laptop backpack, a handbag for me, a man purse for Tom (called a murse) heading to our next adventure. Homeless? Yep! Harried? For sure! Happy? Undoubtedly! This worm or caterpillar was atop Tom's blue Croc as the last shopper as the jewelry sale walked out the door and screamed. We live on a peninsula, a narrow "road to nowhere." We are the second house from the end. With water on both sides of us, there is no sidewalk, no curb, no gutter and little parking room. We've always considered this a small price to pay to be surrounded by water. As a result of this parking dilemma, in 26 years in this house, we've never had a garage sale. The idea of strangers coming to our home, parking on the lawn when the few space run out, made us cringe. Alas, our estate sale guy Jim Anderson suggested I sell my costume jewelry rather than leave it for the estate sale where it becomes difficult to control with many shoppers hovering about. As I wrote in last week's post, I sold my loose gold and silver while awaiting an offer on my wedding ring, hopefully to hear soon. A sale at our home was the most practical solution, albeit our concerns about the parking. My dear friend and next door neighbor offered to be "the guard," helping me put up the signs and keeping me company, making the event less dreadful. I hoped for rain so I could cancel it, watching the weather report every few hours. Why put off the inevitable? Then, I looked up "jewelry lots" on eBay, hoping to find that I'd get a good price for the entire batch. Not the case. The signs I made on neon pink poster paper with a huge black marker, all purchased at the Dollar Store for less than $5, easily glued to the sign bases Tom made for me last weekend using four $1.69 wooden stakes, nailed to four pieces of particle board the hardware store cut for me for $9.00. Total sign cost was around $20. With the signs in the ground appropriately scattered throughout the neighborhood, my dear neighbor and I sat in my kitchen sipping frosty glasses of iced tea, viewing the pleasing display of the 200+ pieces patiently awaiting the first customer. We were tentatively optimistic. As it turned out 2:00 pm was a poor time to start a sale. We were hoping to catch the "on their way home from work" crowd, which we did to a degree. But the first three hours were a bust. A kindly, experienced garage sale enthusiast suggested we try in the early morning when the serious shoppers are frantically driving around. The end result of the sale was $152, not what I'd expected. I looked up "jewelry lots" on eBay again. My dear neighbor pushed me, "Let's do it again next Thursday. I'll help!" Grudgingly, I agreed. Next Thursday at 8 am we'll be ready to roll again. I'll change the time on the signs with the purchase of one neon pink poster for $.69, cut into small squares to tape over the old times with the new times. Anyone know what this is? Or what this will be someday soon? Is it a worm...or a larvae? I don't have time to look it up online. 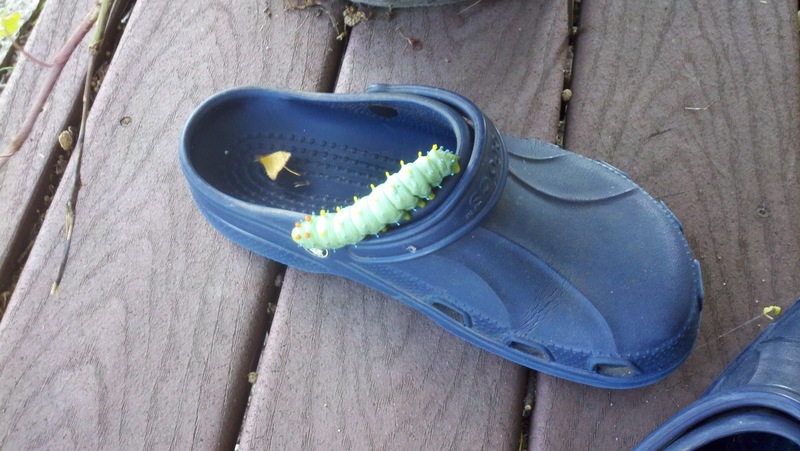 Good thing this critter wasn't inside his Croc when Tom slipped his foot inside. I guess Africa will have bigger, scarier such things. I didn't scream. Instead I took a photo. Deciding on what type of luggage we needed wasn't easy. It must be lightweight, durable, affordable and possessing good quality. As always, research has been an integral part of any of our decisions. Off and on over the past several months I read reviews and baggage restrictions for a multitude of airlines traveling to our required three flights: Rome to Mombasa, Kenya; Mombasa, Kenya to Nelspruit, South Africa and Lisbon, Portugal to the island of Madiera, Portugal and back to Lisbon, a total of four flights. To fly coach on some airlines, one checked bag, one carry on, one computer backpack with one handbag per person is acceptable. (Tom, much to his dismay will now be carrying a "murse,"a man purse or...what they also call a messenger bag). Other airlines allow two checked bags. If one travels first class, most airlines will allow more bags, number unknown. We are less than two months premature into booking our first flight to Mombasa, Kenya which we'll do as soon as possible. After researching the cost of first class with some possible discounts, it may pay to bite the bullet and go first class or perhaps business class, depending on baggage restrictions and fares. The flight from Rome to Kenya with a few layovers, is a minimum of 17 hours. There are a few better priced options for as many as 29 hours (yikes!). First class would provide food (hopefully pin-free) and comfortable seating, enabling one to sleep with more leg room to accommodate my 34" inseam, much longer than Tom's. This morning, as I perused the overstuffed totes in our bedroom, filled to the brim with more "stuff" to pack, it appears we may each require three checked bags. With our two 250 pound capacity luggage carts, we can do this! Last night, we purchased four 30" Antler bags, a company in the UK known for manufacturing quality lightweight bags, along with two matching carry on bags from eBags at their eBay store. After this morning, I faced the reality that we may as well purchase two more of the 30" bags, once we've inspected them. Luckily, eBags provides free shipping both ways in the event one is dissatisfied. Originally, we had planned to buy the Antler Zero 30" bag, retailing for $540, priced for $249 at eBay. The quality was slightly better than what which we purchased. But, the thought of spending almost $1000 for four bags killed me, as opposed to the $444 we paid last night plus $79 for each of the two carry on bags. The color: ORANGE (easy to find amongst all the black bags at baggage claim). Also, the color causes the bag to appear more of a "fashion" bag than an upscale expensive bag which may ultimately deter thieves. We leave Minnesota on Halloween, orange...get it? Hahaha (Tom didn't think that was funny). TSA locks allowing us to lock the bags but avoiding the TSA's typical habit of cutting off non-regulation locks. This doesn't provide a guarantee against theft but it does reduce the risk. Let's talk about the ORANGE. Why not, orange? One would hesitate to do a bright color for fear of what others would think. Right? Is there any other reason? None that I can think of. If you think of any, please post a comment here. ORANGE BAGS? Yes, some passersby may look at our bags and say, "Ugly bags!" We will laugh, hoping they aren't referring to us and say to one another, "What thief is going to grab an orange bag from the carousel in baggage claim and run off, hoping to blend in with the crowd? Scorpions in Africa may be from 6"-8"
After reading numerous articles as to appropriate clothing while on safari, it only took a few sentences for me to be convinced that proper boots are a must in the bush. Some websites recommended a short boot and others suggested a taller boot. Although only slightly concerned about creatures crawling up our pant legs, I have opted for the "long BugsAway pants tucked into the boot concept" with a lace up boot. This will allow me to tighten the boot at the top to prevent Mr. Scorpion from running up the boot and slithering down the inside of the boot. Oh, please no. Tom, who's used to heavy steel toe boot required by his 42 year railroad job, doesn't like the idea of boots at all, hoping to toss them out with his watch on retirement day, this upcoming Halloween. With Mr. Scorpion in mind, I'll continue to get him on board. Perhaps, he'll come around when he sees this photo! Functional: Must keep creatures out. Must be sturdy, providing sure footing. Must have a thick sole to prevent puncture by thorny brush or snake bite. Water resistant: Waterproof not necessary but they must be able to withstand a rainy day, subsequently drying without damage. Comfortable: My feet are picky. My feet insist on comfortable shoes. There is nothing wrong with my feet. I don't have bunions or protrusions. I have a high instep which is manageable. For some goofy reason, shoes hurt my feet. Most of the shoes I'll be selling at the estate sale will be newer shoes I've wore only once, blistering my feet, never to be worn again. The remainder will be comfortable, overly worn shoes, for which no one would want to pay $1. Proper fit: Comfortable could cover this aspect but boots may be somewhat comfortable in the foot with a poor fit around the ankle and particularly, the calf. I have skinny calves. Yes, I have skinny muscular calves after years of working out and running around doing my 10,000 steps a day for most of my adult life. My calves are small, measuring only 12". Most boots have a shaft circumference of 14"-15" leaving me with a huge gap, large enough to fit my hand. A lace-up boot may compensate for this anomaly. Attractive, stylish: Yea, yea, yea, I know. Cute boots are not necessary. If all of the above can be accomplished and, the boots are stylish, I will consider it a bonus. After we leave Africa, the boots, if stylish will be worn and enjoyed for years to come. Lightweight: The pair of boots I purchased last night, weight 1.4 pounds. This is the nature of the beast (no pun intended). Boots take up vital space in the suitcase. Solution: wear the boots while traveling by air when weight is an issue. (All bags, regardless of the number are acceptable on cruises, provided any one bag doesn't exceed 70 pounds.) If the boots are comfortable, wearing them for long periods will be possible. Wearing socks, I can remove them on the plane if necessary. Yes, I know, the security check at airports requires the removal of boots. OK, let's see. Scorpion? Boots? Scorpion? Boots? Boots win!!! Price: This was tough. How does one find all the above at a great price? Well made boots are expensive. For weeks, I watched boot sales on eBay to no avail. I checked out endless boot resellers, discount wholesale stores and sales at major retailers. On eBay most were offered at BUY IT NOW prices resulting in little opportunity to negotiate, although I did contact a few sellers with lower offers, with no results. Last night, I decided to return to my normal process; find the product I like, then price shop. The Olympics on TV in the background, Tom at my side, content in his comfy chair, playing with Ancestry.com, his favorite pastime activity, I finally found the perfect boot from a manufacturer I know is comfortable and fits me well. Excited by this find, the price and size search began. Two hours later, frustrated with little results, I wandered over to Amazon.com, my favorite online store where I often buy everyday products at great prices, with free shipping, avoiding a trip to a store. When I had searched for the boots on Google, a link to Amazon came up on the 2nd page indicating a "weak reference" to the product which drove me away. Usually an item comes up if the search includes the brand, the model and the size. In this case, it did not. Although not hopeful, I pulled up the Amazon.com link to find my boots!! My size, to boot (no pun intended)! Yea! The total price with shipping was $161.98. Of course, I would have loved to buy these boots for less. Originally, they were offered for $174.98 + shipping. The $25 savings provided a small consolation but then again, Mr. Scorpion definitely provided the final motivation. Life is never risk free..